The California Wine Tasting in March 2019 was a big event with no less than 135 wine producers present. The title chosen for the event, Dream Big, promised a lot. One had better set priorities and my priority was to focus on pinot noir from as many interesting producers as possible. It happens to be a favourite grape of mine and earlier tastings of Oregon wines have created a desire to taste more wines made from this grape from the American West Coast. California has previously shown ambitions in the area and I was looking forward to testing how the development looked. The conditions for growing pinot noir in California are not as good as in Oregon because of the significantly higher mean daily temperature. The conditions for grapes that can withstand a warmer climate are better and growing such a sensitive grape as pinot noir feels less wise. However, there are areas in California that have the right conditions, either by being at high altitude or being influenced by cooling winds from the sea, especially at night so that hot days alternate with cool nights, providing good conditions for optimal grape maturation with a balance between acidity and sweetness. The type of soil also plays a role. Santa Barbara County and San Luis Obispo County in the southern Central Coast. Pinot noir wines from all these areas, and some more, were available to try and as mentioned, it was not possible to try all, but I had enough to draw some conclusions and to mention some producers whose wines I felt were particularly good. Otherwise, the quality of the tasted wines was consistently high as well as the price level for the best wines, the latter partly a consequence both of a high dollar exchange rate and also a reflection of the work put into them and the limited production volumes. Compared to their pinot noir cousins from Oregon, the wines from California feel more broad-shouldered. The first table I ended up at happened to be with the Francis Ford Coppola Winery which surprised with a bunch of high-quality wines, including a really good pinot noir, Diamond Collection Golden Tier Pinot Noir 2017. The wine turned out to be produced in Oregon’s Willamette Valley. The wine had fresh and young fruitiness with red berries, high acidity; fine tannins gave a good balance and also some elegance to the wine. Long aftertaste. Costs in the US $ 21. No Swedish representation, unfortunately, but Coppola’s wines can be purchased from Otto Suenson & Co in Denmark and they also have e.g. Diamond Collection Pinot Noir 2016 from Monterey with more fruit, raspberries / lingonberries, and less acidity than the Oregon cousin. Costs ~27 euro. In order to then take the different areas more or less in order, it may be appropriate to start in the North Coast, more specifically in the Carneros area, which had a pretty good selection of wines from many good producers. For example, Carneros Pinot Noir Estate Grown 2016 from Schug, which was long on the palate after an initial nose and palate of red berries, some smoke and spice from the oak barrels (16 months ageing). The fruit was young and the wine felt promising with a few years in the cellar. The wine is a cuvée of selected pinot noir clones from various vineyards in Carneros. A cooler wine from the same producer made from grapes from both Carneros and Sonoma Coast was the 2016 Schug Pinot Noir, which has also been aged in neutral barrels. The Schug family is originally from Germany and has the ambition to preserve the European terroir tradition in its wines. Another producer in Carneros was Starmont Winery, which has been there for about 30 years and is owned by the Schlatter family, which also owns Merryvale Wines. Both vineyards originate from the Stanley Ranch. Starmont Carneros Pinot Noir 2016 had a rather dark colour for pinot noir, a nose of cherries and a sweet-fruity taste with a touch of oak, with a good structure and balance. The wine has been aged for 11 months in French barrels, of which 20% are new. The 2012 is available for ~34 euro. Merryvale 2015 Pinot Noir Carneros-Napa Valley had a nose of red berries, warm fruit with spicy touches and a long aftertaste. Au Contraire Lawler Vineyard Pinot Noir 2015 (about $ 25) also comes from Carneros, more specifically from Taub Family Vineyards. The wine was relatively dark for pinot noir, red berries with herbal touches. Taste of pure fruit of cherries and plums, as well as good tannins, left a balanced impression. If we then move to the northern Central Coast we start approaching Monterey but before that, we pass the Santa Cruz mountains. At the foot of these, we find Birichino, which was founded as late as 2008 by Alex Krause and John Locke who both had a background on the Bonny Doon Vineyard in the same neighbourhood. The motto for these gentlemen is to make expressive and grape-typical wines from old vines. The wines are usually unfiltered and made with natural yeast. Like many wine producers, they don’t just want to stand out with good wines, but also make interesting labels. Birichino has a German artist who makes several of the labels based on, among others, Magna Carta and Olaus Magnus’ history of the Nordic peoples. S:t Göran (Saint George) and the Dragon thus adorn two of their wines. The range includes two pinot noirs, Birichino Pinot Noir St. Georges 2016, and Birichino Pinot Noir Lilo Vineyard 2013 (~37 euro). The St Georges had a nose and taste of red berries with some spice; good acidity and tannins provided a good structure for the wine, which was elegant. The grapes in the wine come from 4 different vineyards Besson, Lilo, Larry, and Antle, all with different characteristics. Besson, for example, has vines that are over 100 years old. To give additional character to the wine, they retain 20% of whole bunches and the fermentation takes place only with natural yeast in steel tanks. Aged 9 months in neutral oak barrels and bottling unfiltered. The Lilo wine had a darker colour, a rather intense nose of red berries, a taste of dark cherries with herbaceous touches. Fine tannins gave good balance and long aftertaste. Even more so in this wine made from grapes only from the Lilo vineyard, which is located in the Santa Cruz Mountains overlooking the Bay of Monterey. Steep slopes lead to tricky harvesting. The grapes can only be hand-picked and after sorting and pressing with partly whole bunches, fermentation takes place in steel tanks with natural yeast and then ageing for about 12 months in neutral barrels. Bottling is unfiltered. Like most producers, Birichino also makes wines from other grapes that suit their requirements. Worth noting is a cinsault made from pre-phylloxera vines. In Sweden, there is also a Chenin Blanc wine named Jurrasic Park. Calera is a well-known producer in Sweden, now represented by Johan Lidby. The wines consistently held a very high class and especially Mount Harlam Ryan 2015 impressed with both power and structure. The comparison with the same wine from 2014 (~60 euro) was very interesting. This was a year when the harvest had been forced due to the drought. The wine felt a bit “greener” but had a nice structure and good balance, which showed that it is possible to make good wines even bad years if you are careful in production and winemaking. A number of wines in the price range of 50-100 euro are available too. Not to forget, however, is the entry-level wine which has been on the market for many years, Calera Central Coast Pinot Noir 2016 (~27 euro), which has a nose and taste of red berries, some spice, pure fruit flavours and a long aftertaste. You must say that it is grape-typical. Calera was founded in 1975 by Josh Jensen, who after a few years with top producers in Burgundy wanted to find the “right” place in California to grow pinot noir on. He found it 700 m up on Mount Harlan, located in San Benito County east of Monterey with limestone soil. Careful selection of clones and vineyards and wine cellar work (including a 6-storey cellar for vinification, based entirely on gravity) has yielded results. The wines often have a generous fruit but are at the same time tight and well-structured, grape-typical in a Californian way. If we move south then Pali Wine Co will be our gateway to many very good winemakers, sometimes in the mountains in some areas north of Santa Barbara in the southern Central Coast. The company was founded in 2005 by two wine entrepreneurs, Tim Perr and Scott Knight, to produce artisanal wines from small vineyards with pinot noir. In 2007, the volume was already so large that a completely new and modern winery was built in Lompoc. Since 2007/2008, they have a chief winemaker, Aaron Walker, and a consulting winemaker, Kenneth Juhasz. Both aim for the wines from Pali to give maximum expression of the area they come from. The top quality of the fruit is, therefore, a priority when selecting the vineyard / grape producer for the different wines produced. The main focus is pinot noir, but they also have some other grape varieties, for example, chardonnay. I tried Pali Huntington Pinot Noir 2015, Santa Barbara County (~23 euro) which is a cuvée from grapes from the best areas of Santa Barbara County. The wine has been aged in barrels for 10 months, of which 25% are new French. There was plenty of ripe cherries and raspberries with herbaceous touches and good acidity and tannins that gave the wine a good structure. Pleasant aftertaste. Pali also produces an extensive range of vineyard-designated pinot noir wines in the price range between $ 25 and $ 75 per bottle, so the tasted wine may well be regarded as an entry wine. They also have a pinot noir from Oregon (Willamette Valley) and from Russian River in the North Coast. The next interesting producer was Talley Vineyards, who was represented by Vin-de-Cal International at the fair. The Talley family owns 6 unique vineyards with a total of 70 ha in San Luis Obispo County, which is the northern neighbour to Santa Barbara County. What mainly makes these areas interesting for pinot noir is that the mountains here do not stretch north/south, but more west/east which means that the cool winds from the sea with accompanying fogs have good access to the vineyards. Thus, they create a microclimate with hot days and cool nights that are perfect for optimal maturation of the grapes (the balance between sweet fruit and acidity). Talleys Vineyards are spread over the two AVAs, the Arroyo Grande Valley, and the Edna Valley. The Arroyo Valley has north-east/south-west location and has been called one of the wine world’s most temperate valleys with a very long growing season, from budding in February, flowering early May and to harvest in September. Chardonnay and pinot noir have been planted in the coastal parts that have southwest slopes. Here you can find Rosemary’s vineyard with the Pacific Ocean just 10 km to the southwest. It is the Talley’s coolest location. The vineyard surrounds one of the founders’ homes. The soil consists of what is called “shaley loam” which can be translated into a sedimentary claystone. In combination with the cool location, it will provide excellent pinot noir and chardonnay wines with a fresh taste, good structure, and energy. This was true in the Rosemary’s Pinot Noir 2016 (about 75 dollars) which had both freshness, power and structure and felt lovely right now, but will certainly be even better after a few years in the cellar. The vintage is considered to be one of the best in the Rosemary area with perfectly optimal weather conditions throughout the growing and harvesting season. Since 1986, they also make a Talley Estate Pinot Noir, now 2016 (about 42 dollars) that reflects the nature of Arroyo Grande Valley. I can add that all pinot noir wines are hand harvested. After hand sorting, destemming and sorting is done before the grapes of their own weight fall into open fermentation tanks for a “cold soak” for 3-5 days for extraction of colour, aroma, and taste. Natural yeast gives a long fermentation. Then the wine is aged in medium toasted French oak barrels (about 1/3 new) for 15-18 months before bottling which is done without filtration. From the Edna Valley AVA came a superb wine from Chamisal Vineyards, Chamisal Estate Pinot Noir 2015. (about $ 50). The wine was a very well-made powerhouse with nose and palate of ripe cherries and strawberries, balanced with just enough tannins for a lingering pleasing finish. The harvest had been optimal for acidity/sweetness balance. The grapes fermented with natural yeast at low temperature for about 10 days. Then aged in French oak barrels (35% new) for 10 months. Chamisal was one of the pioneers of the Edna Valley and has been experimenting with various pinot noir clones since 1973. 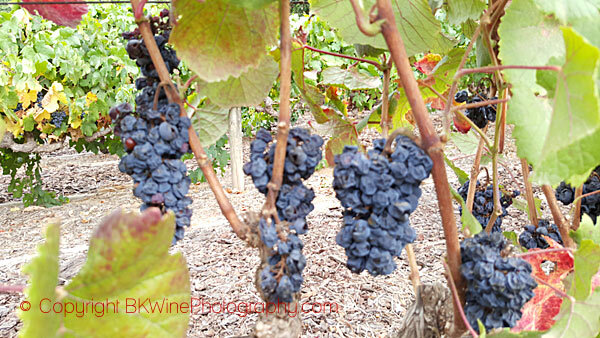 Chamisal also produces pinot noir wines from other vineyards with good locations on the Central Coast. 2015 was a year when harvest yields were low, partly due to several dry years earlier and partly due to a cold spring that reduced the grape formation. The rest of the growing season was good with, above all, a good harvest month in September for optimally ripe grapes. The grapes had a very high concentration and maceration could be short. Nor did they need much oak barrel ageing to balance the wine. Both power and elegance were present in the grape raw material. Both wines were aged 16 months on larger French oak barrels, 20% new in the first wine and 35% in the other. These wines are very good to drink right now with a certain youthful robustness in the structure but will be softer and more elegant with a few years of ageing. Having arrived here in this report, one might ask where Sonoma Coast and the Russian River Valley in Sonoma are. Were there no producers/wines from that were worth mentioning? The answer is that for reasons of space and since those wines have long been on the market in Sweden, I have chosen not to include anything, except very summary facts about some. Around the 20 euro mark, there were the Rodney Strong Russian River Pinot Noir 2015, De Loach Russian River Pinot Noir 2015 and Black Stallion Russian River Pinot Noir 2016. They reflected well on the character of Russian River wines at an affordable price. Black Stallion Estate Winery has, as its name suggests, its origins in a large horse ranch, active around 50 years ago, and which is linked to Francis Ford Coppola who shot the cult movie “Apocalypse Now” at the ranch. And then I’m back where I started with a filmmaker who was bitten by winemaking! And did well. So, were there any easy-drinking and more budget-friendly pinot noir wines? In fact, under 20 euro I found Irony Monterey Pinot Noir 2017 (15 euro), which was quite OK and affordable. With so many fantastic pinot noir wines that were presented here, one can only wish that the Swedish krona exchange rate improved so that more importers could find it worthwhile to bring in more of these wines to Sweden. Or do we have to wait until we get real wine shops, as in Denmark? Carl-Erik Kanne is a long time wine enthusiast and fervent wine taster. He reports from wine tastings and wine events in Stockholm for BKWine Magazine.